SHAGGY, ALI CAMPBELL’S UB40, BERES HAMMOND & MAXI PRIEST PERFORM AT THE SOUNDS OF REGGAE CONCERT IN CELEBRATION OF 50 YEARS OF JAMAICAN INDEPENDENCE | STREETS OF NEW YORK 411 INC.
Brooklyn, NY – August, 2012 – In celebration of Jamaica’s 50 years of independence, Grammy Award-winning artist Shaggy, internationally recognized legendary band Ali Campbell’s UB40, veteran reggae crooner Beres Hammond and British reggae star Maxi Priest will perform in The Sounds of Reggae concert at Brooklyn’s Barclays Center on Wednesday, December 12. Tickets for the concert are available through Ticketmaster by visiting www.barclayscenter.com orwww.ticketmaster.com, or by calling 800-745-3000. The year 2012 marks Jamaica’s 50 years of independence. It was on August 6, 1962 that the Caribbean island claimed its independence from British rule. To commemorate the occasion, Jamaicans and enthusiasts of its heritage have participated in celebrations all over the world over the course of the year. 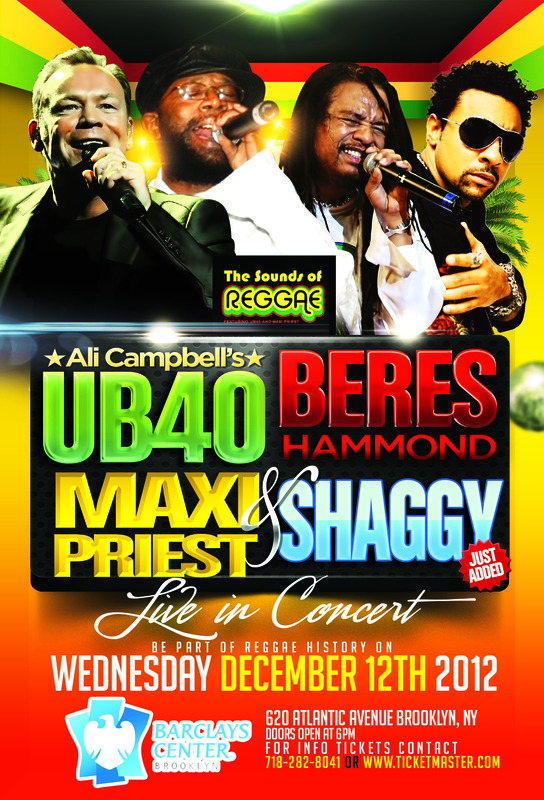 New York City will continue the celebration of this milestone with The Sounds of Reggae concert at Barclays Center in Brooklyn on December 12th.